In Romania, some people say that when you try a new food, you should make a wish. Every time that I’ve tried a new food here, I’ve wished for the same thing: spring, spring, spring! When I arrived in Romania a few months ago, coming from the oppressively hot Bangkok (and not even in the “hot season”! ), I expected to need a few days to adjust. But instead, when I stepped out of the Bucharest airport, I felt an enormous sense of elation and recognition: cold! That spring cold, where the air is frigid but the sun is strong! That spring cold, where the ground has yet to thaw but already the plants are shooting up! That spring cold, where you need to keep moving to stay warm, and yet everyone is outside. I walked around the city for a few hours my first day, feeling like I had reentered my native habitat: the cold ecosystem, just before a spring. It only snowed a few times while I was in Romania. This particular snowfall, at Iulia’s farm, the snow only stuck around for about two hours in the early morning. But the snow brought out even more vivid colors after it melted. And flowers celebrating the absence of snow! Is there anything more reassuring, or beautiful, than spring? I spent the most recent springs of my life in Wisconsin. I love that first day that the temperature tops 32°F (0°C). The entire population changes into shorts and sandals, happy to expose skin to wind that doesn’t bite. I love how suddenly no one can sit inside, even when the snow hasn’t yet fully melted. I love that productivity declines inversely proportional to the rising temperatures. But mostly, I love spending time outside in spring, when things start to grow again. I was happy to have work on farms in Romania as the spring season started, because it gave me an excuse to be outside. Spring is always a busy time on farms, and to me, it always seems to involve the heaviest manual labor: preparing the soil, moving debris that piled up over winter, transplanting, and cutting back early spring growth of unwanted plants. Though many days were bitter and cold, I saw promises of spring everywhere I looked: budding flowers, shoots of overwintered garlic, and happy people shedding winter layers. Springtime on a farm is a joyful time. The first buds on the apple trees. Before there are many vegetables and greens in the garden, Ana, a friend of Iulia’s, uses forest plants to spice up our meals. The rice dish on the left is cooked with dockweed and nettles, two native plants she collected from the forest. Chico, the farm puppy, sniffs the springtime flowers with me in the orchard. After celebrating spring on farms for a few months in Romania, I headed to Bulgaria for a few weeks to be a tourist. Luckily, Bulgarians love spring as much as I do, and they celebrate in a truly beautiful way. On the first day of March, every Bulgarian buys “martenitsa” (мартеница) bracelets or adornments, which are made of white and red thread. Friends and family give them to one another, and most people wear them on their wrists. Then, at the first sign of spring, usually the sighting of a stork or a budding tree, the wearer takes off the bracelets and leaves them nearby, usually hanging on a budding plant. This tradition means that spring is consistently in your peripheral vision. The red and white colors of the bracelets add color to the landscape before the buds have fully flowered, and it is a constant reminder of the season.Though I arrive a little too late to fully participate in the tradition, I loved seeing these bracelets hung from every early-budding tree. This is a country that celebrates spring like I do: loudly, colorfully, and with a lot of joy. 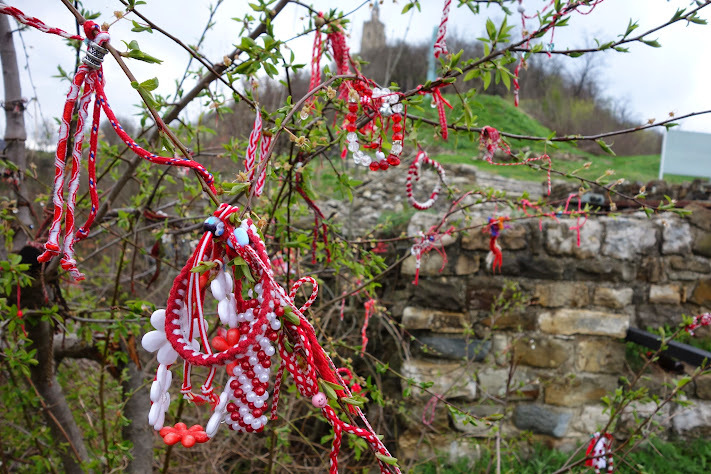 A tree, adorned with various martenitsa bracelets, in Veliko Tarnovo. I recently had a lot of time to meditate on the classic idiomatic phrase, “to make a mountain out of a molehill”, as I spent an afternoon raking molehills flat in a Romanian apple orchard. The work is important because if these molehills, mounds of soil brought up to the surface by moles digging underground tunnels, are left by themselves, within a few years the ground becomes uneven. Bumpy land makes the hay harvest with the scythe difficult and dangerous. So, in the spring, here Iulia, my host, and I are, roaming around her apple orchard with rakes, flattening each molehill as we find them. And while, indeed, the molehills are not mountains, moles are certainly industrious creatures. “My God, is there any soil even left underground?” Iulia sighs. After hour two of molehill-flattening, I agree with her. The moles have built an underground system more thorough and widespread than any metro I’ve ever seen. But, Iulia doesn’t seem to mind too much. This orchard is home to her, and it is home to the moles too. Old shoes used as planters for succulents- Iulia reuses everything in her orchard. Since Iulia moved with her family to rural Transylvania two years ago, she has been even more industrious than the moles. Iulia bought an apple orchard that had been abandoned for decades. While the trees are well-established and productive, the land has taken a lot of work to be reclaimed for agriculture. Wild plants from the forest encroach on the borders of the orchard, and the apple trees have more sprouting branches than they know what to do with. Iulia is dedicated, however, and her land shows her efforts for the past few years. Iulia practices permaculture, the newest agricultural buzzword, in this orchard. Every farmer has their own definition and beliefs about permaculture, but (at this writer’s risk of a thousand ideological challenges) the basic premise revolves around considering a farm as an ecosystem, rather than a factory. There is an emphasis on biodiversity and organic methods, and materials are continuously re-purposed and re-used. Iulia’s farm is in rural Transylvania, a quiet and calm region. There are cars, electricity, and many other trappings of city life. But many villagers also still use horse and carriage to transport manure, hand-draw their water from the local wells, and collect chicken eggs daily from their flocks. People here are living “close to the land”. After decades in big cities, Iulia has slipped back into village life, but with a new focus: permaculture. A view of part of Iulia’s vegetable garden, facing the orchard. She builds her vegetable beds using a process similar to hugelkultur, where underneath the bed, there are layers of organic materials. Wood, compost, sand, and other organic materials are layered to decompose slowly under the top layer of soil. Over time, the soil in the beds should improve even more as these organic materials decompose. On the left-hand side is a solar-heated shower- simply add water to the black box, add a curtain around the outside (unless you’re adventurous), and wait for the water to heat up in the sun for your outdoor shower! The other volunteer, an American named Emily, and I spend one sleety day sewing down feathers into a blanket. I had never realized how warm real down feathers are! One especially cold day, instead of working outside, Emily, another volunteer, and I help with a household project, sewing down feathers into an old, mass-manufactured blanket from Ikea. Iulia found old pillows and blankets in the house when she moved in, and they contained real, hand-collected and cleaned chicken and goose feathers in them. The amount of time that goes into collecting feathers like this, only from the soft bellies of chickens or young chicks, is incomprehensible, but they are worth their weight in gold. Emily and I cut open the blanket, stuff it with feathers, and then carefully sew it back up. A cheap blanket from Ikea, previously filled with synthetic stuffing, suddenly became a warm, soft, comforting down quilt. This is why I like Iulia’s outlook: nothing is wasted. Old ceramic shingles become stones for a path. Fallen logs are cut to border garden beds, sand from deepening the well is reused in creating fertile soil. She transforms things. Iulia (right) and her friend Anna (center) spend one rainy afternoon teaching me how to make soap. They make all of their own soap and cosmetic products, using organic oils, fragrances, and sodium bicarbonate (chemical version of lye). The soap is still in liquid form at this point; I am mixing it in the bowl. Today, we are manufacturing some things that are difficult to transform. In many rural communities, from Senegal to Romania, the disposal of plastics has become an enormous issue. In Iulia’s village, this rural community that could compost all of its trash for centuries is now faced with a reality that this new trash will not decompose in a few years. Trash disposal systems or the concept of littering have not yet become common, and plastics have begun to pile up in forests and along roadways. How do these communities adapt to these changes? Plastics present a large challenge, but other materials are possible to quite easily reuse- water, organic materials, things we clear from our land, biological waste, and food waste. Many of the materials that we seek to dispose of are instead capable of being usefully transformed. However, in American cities, we often see these materials as waste, just like plastics. Food waste is thrown away; grass clippings are shipped away in paper landscaping bags. Iulia sees waste as an opportunity for reuse. Iulia’s house is not on any water system; drinking water is drawn from a spring well by hand, and water for washing is rainwater collected off of the roof. While I am staying with the family, they put the final touches on the outdoor compost toilet. The house is heated from two efficient wood stoves, using wood collected from the orchard. The family grows most of the fruit and vegetables that they eat, and the meat and cheese comes from trading with their neighbors. There is very little waste coming out of this household, and it is because Iulia chooses to reuse materials. This re-conception of waste is the foundation of permaculture, of seeing the ecosystem. When we see our farms or kitchens as factories, and we ship away our waste, we forget that we have a responsibility for what we create. Permaculture is growing in the world because it imitates the systems that have worked for lifetimes. Living ecosystems do not ship away waste; materials are instead continuously transformed. And when we imitate nature- as Iulia does on her farm, as my friends do in Wisconsin, as Pom and U do in Thailand- we are transforming. Panoramic view from Iulia’s home, in the late evening. She has the best view in the village. On the plane from Bangkok to Bucharest, Romania, I couldn’t stop thinking about it, a new mantra: “I’m trading rice for bread”. Trading ginger, fish sauce, and coconut for new flavors. How will I sustain myself without the richest broths in the world? What will I eat, if not fresh mango? Would my digestive system even work properly without thrice daily portions of rice? Every culture seems to have a “fast food”, cheap on-the-go snacks for people without a lot of time to eat. In America, chain restaurants or vending machines fill this role. In southeast Asia, street stalls serving hearty and healthy bowls of soup or takeaway packages of curries line the street (which in my opinion is superior in every respect). When I arrived in Bucharest, I looked for their fast food: bread. Their bakeries have windows facing the street, and the cashier quickly grabs your order, slips it into a bag, and takes your payment. Most contain a sweet jam, or a combination of meat and cheese. People walk the streets with various pastries and sandwiches in hand, bundled up against the cold. Bread is a utensil, used to transfer food from your plate to your mouth. Bread is a sponge, wiping each plate clean before the dishes are even started. And bread is the ubiquitous flavor, the base of the meal, the necessary component. I quickly learned that “please set the table”, in a Romanian home, implies a series of steps: shake out the breadcrumbs from the tablecloth, set the plates and utensils, and then cut the new bread. To draw from recent months: as rice is to southeast Asia, bread is to eastern Europe. I am in for quite the change of cuisine. Bread, bread! There was a basket full of bread on the table every meal. In one home in which I stayed, I was the designated bread cutter- a lofty title. To celebrate Mucenici, a Christian holiday in Romania that also celebrates the beginning of the growing season, Liliana, one host, and I made pastries. The dough is rolled into thin strips, baked in a figure eight shape, and then covered in honey and walnuts. They say that when you feed someone on this day, you are also feeding your ancestors. If so, I was so well fed, Liliana’s ancestors must have been stuffed! In Romanian cuisine, in addition to the base of bread, onion and garlic are always present. A balanced meal contains one or the other. Many Romanians believe that cooking garlic or onion is somewhat toxic for the body, and so these members of the allium family are usually eaten raw, on the side. I’ve seen few tables in Romanian homes that do not have a basket of bread and a bowl of raw garlic or onion. Ceapeă, meaning “onion”, was one of the first Romanian words that I learned. (“Pass the ceapeă!”) Spring onions, garlic, and red or yellow onions are continually passed around during a meal. Romanians love the flavor, and many of the traditional dishes are meant to be eaten with it. Romanians even have a hidden treasure, off the tourist track- an onion monument, dedicated to the ceapeă, located in northwestern Transylvania. One day, while working on an apple orchard in Transylvania, the family welcomes a friend for lunch. During the meal, he asks for a few extra onions, even though there is a bowl of cut onions on the table. I watch, barely keeping my mouth from hanging open, as he expertly peels them and chomps into them, apple-style. He devours two raw onions in a matter of minutes. I say nothing at the time, listening to the rhythm of the larger conversation in Romanian between the rest of the family. But after the meal I ask quietly, “is that… typical?” My question is greeted by laughter, and we all joke together. While that man might have been exceptional, it is true: Romanians see onion and garlic as an entire food group. Ciorbă, a sour soup popular in Romania, is one of my favorite Romanian dishes. The sour flavor comes from a fermented wheat sauce, or a special type of sour plant. With some cream and a side of bread, it is the perfect lunch. Every visitor to a Romanian home will remember slanina (the meat on the left hand side) Slanina is pork fat that is salted for a month before it is smoked. The fat comes from a Romanian variety of pig, and there is allegedly no cholesterol- only good fats. The flavor of slanina is like nothing I’ve ever had, a sort of combination of bacon and cheese. It is typically eaten with bread and onion or garlic- a classic Romanian combination. During my months in Romania, spending time with two open and welcoming families, I ate like a queen. Romanian cuisine features excellent soups, dried meats, and fresh dairy products. Even in the early spring, there are still root vegetables and canned foods leftover from the fall. Meals are long affairs, always full of conversation and laughter. But although the bread and onion may feed a people, liquor truly sustains them. Eastern European liquors vary by the region, but northern Romanians prefer țuica, a type of clear fruit brandy. Tuica is drank in tiny glasses, sipping slowly on one shot at a time. It is strong and… effective. While it certainly does keep you warm, it may also lower your work productivity, as I found out after many a lunchtime glass. Luckily, there was always bread and onion to sober me up. Me with some of the family that hosted me in Transylvania. We spent many nights sitting around the dinner table drinking țuica and exchanging stories. I giggle at Pom’s joke, and she smiles, continuing to pound lemongrass and galangal together. 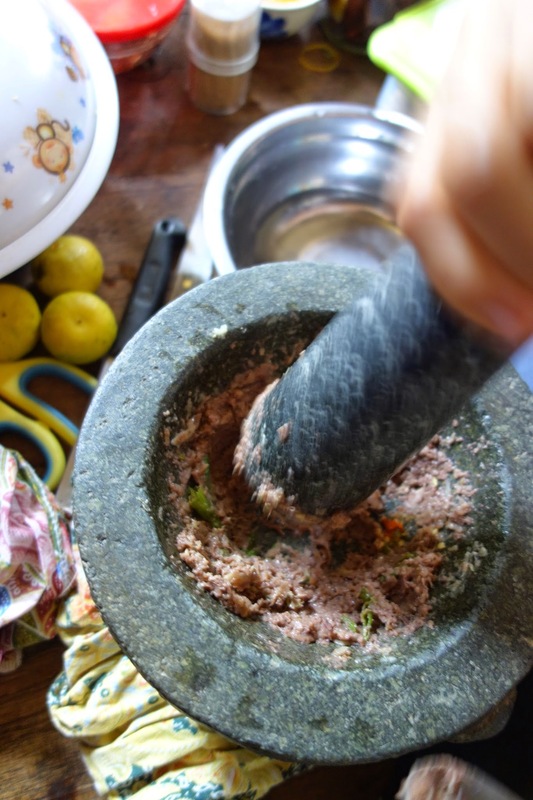 She’s making green curry paste, a long, intensive process that fills the house with the sound of her mortar and pestle. She’s just explained how the Thai used to say that a man could judge a potential wife’s character by standing outside her kitchen and listening to the rhythm of the pestle. A slow “thump…thump” indicates laziness. An irregular “thumpthump…thump…thump…” indicates an unfocused woman. A solid “thump thump thump” indicates a good work ethic. I laugh again. These are the lessons that are rarely written down, the jokes passed back and forth while preparing the daily meals. And these are the lessons that I search out. It is here, in this kitchen, that I am learning about Thai culture, because some of the best bits of culture are stored in the universal, daily necessity of eating. And the Thai, more than almost any other people I’ve been around, not only joke about, but truly celebrate, the joy of eating. Pom pounds nam phrik, a chili based dipping sauce, in the mortar and pestle. Some Thai say that they have “two appetites”, one for meals and one for snacks and desserts. This is one of my favorite parts of the food culture- no relegated three meals a day, but a sort of grazing. In a city, food is accessible everywhere; one can find small snacks or entire feasts on the same block. With Pom and U, we eat throughout the day, structuring it around our work that is concentrated in the early morning and early evening. On Valentine’s Day, an imported holiday in Thailand, I ask Pom if she expects flowers. She informs me that instead, U treats her to Swensen’s ice cream. We go to a nearby mall, choosing all our different flavors and toppings (though I haven’t been to a Swensen’s in America, I’m guessing that they don’t carry sweet sticky rice. But it was by far my favorite topping). While sharing our bowl, we joke that there is another appetite, solely dedicated to ice cream. I share this appetite with Pom. One night, Pom, U, and I drive into town to eat dinner. 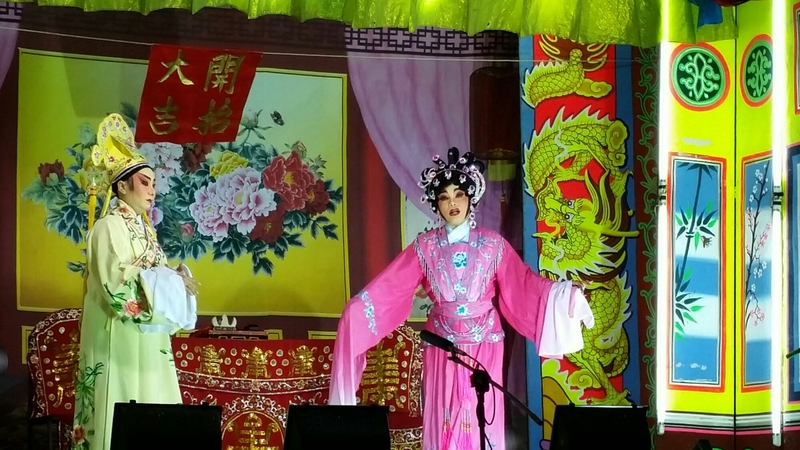 Afterwards we watch a traveling Chinese opera show, sponsored by someone in the community to celebrate the Chinese New Year. One day, while Pom and U are out making deliveries and I am home watering the vegetable garden, some of their friends come to visit. 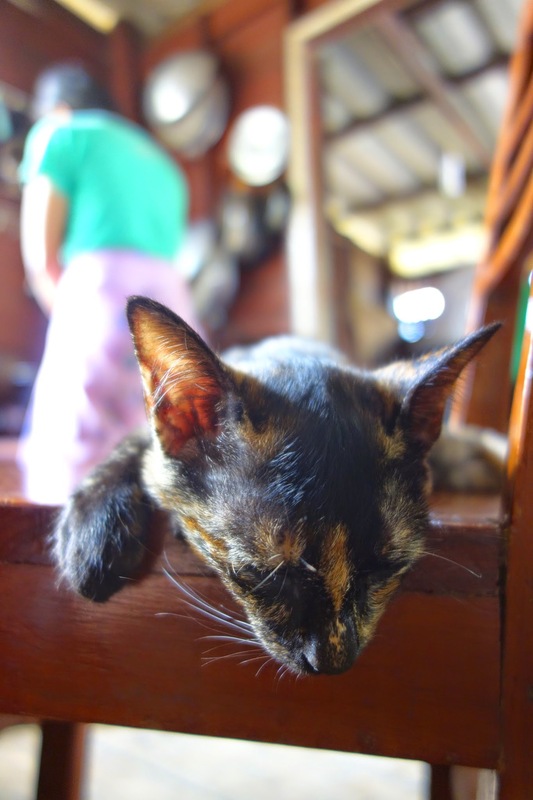 They enter the house bearing snacks from the long car ride from Bangkok, so we quickly become friends. When those snacks are finished, we decide to drive to the town market for more food. I love shopping for food with people who love to eat as much as I do. As we walked through the market, my new friends chatted with every vendor, simultaneously collecting fresh ingredients for dinner and securing free samples from just about everyone. Someone buys grilled, marinated pork, someone else hands me a sticky rice dessert. I follow them around the market, eating and asking questions. I can’t help but notice how friendly they are with all the vendors. They joke, they laugh, and I see that the vendors are sending them every which way. When I ask for some translation, they tell me that every vendor is asking what they will cook tonight, with these ingredients. Before I know it, seemingly half the market is yelling back and forth, telling them where to buy what for dinner- we can’t eat this fish without this vegetable, we really must buy some of that sauce for the chicken, and aren’t we interested in some coconut ice cream? After we finish shopping, we kill time outside the local 7-Eleven for twenty minutes, waiting to buy beer at 5 pm (there is an odd ban on the sale of alcohol between 2 and 5pm in stores in Thailand). I ask what we will cook for dinner, and they assure me that if I make the rice, they will take care of the rest. Dinner takes a few hours to make, and we are slowed by the mosquito hoard that descends at sunset. Swatting mosquitoes, I watch the visitors pound chilis and steam fish, fry chicken and scrub vegetables, chatting all the while. When dinner is finally ready, we gather around the table, and for an instant, everyone is quiet. And then, the chorus of “aroy” (delicious) commences, and everyone’s hands grab from the bounty of bowls. We’ve been eating all day, and yet I cannot seem to stop. The kitchen is full of bowls and bags as we prepare dinner. They are preparing a spicy chicken dish, but they cook a separate plate for this white girl first, using only 6 or 7 chilis, and then cook their own, using an entire bag of chilis. I’ve always found connections through food quite naturally, because it is usually the first thing on my mind. Many evenings, Pom and I would sit around after dinner, talking about our lives and cultures, and the conversation would turn to food. It was a lens through which we could talk about our backgrounds and our influences. After Pom pointed out the natural direction of our conversions, we couldn’t help but laugh, because it was irrefutable. Pom, as much as she may deny it, loves food as much as I do, and it led to an immediate bond. Pom told me that there is a Thai saying about how flies stay with flies, and bees stay with bees. True to that statement, I prefer the kind of people that find joy in sharing food, because that is what brings me joy. The Thai people that I know bring their enthusiasm and humor that I love to their food culture. These are people with whom I would share a meal any day, and that is a gift- I’m staying with these bees. Pom and U, the best dinner company. I love the chaos of a meal with Thai people when everyone is hungry. Every person has their own bowl of rice, and the numerous main dishes are placed in the center of the group. There are no heaping portions piled on plates, like at an American table. Rather, everyone is helping themselves, choosing from a variety of small dishes. Spoonfuls of different foods are added to your bowl, bit by bit, creating perfect combinations of rice and fresh vegetables and sauces. When people are hungry, there are hands everywhere, grabbing spoons and dishes as talk flies back and forth. According to Pom, a balanced Thai meal (on top of rice, of course) has three components- protein, nutrition, and flavor. 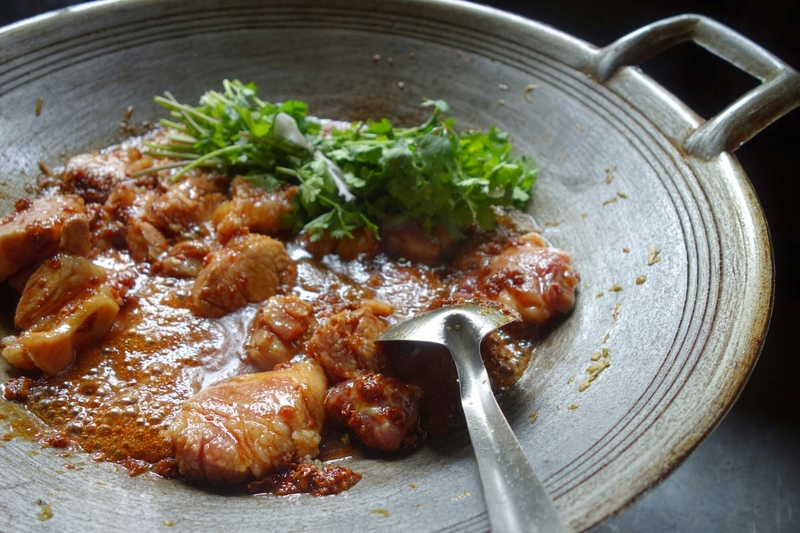 For example, the perfect bite may be fried fish, some bitter but highly nutritious greens, and a spoonful of a sweet type of nam phrik (meaning a chili based sauce, pounded in mortar and pestle). These are three different dishes, and you need to arrange it all on top of the rice before taking a delicious, balanced bite. Some dishes have the protein and flavor together, like a chicken curry, and the nutrition will be raw vegetables like cucumber or eggplant (aubergine) eaten on the side. In a way, Thai cuisine is very personalized. With a multitude of dishes and a serve-yourself mentality, each person is creating combinations on their plate that match their palate. You select what you eat and how much. As a newcomer to this dining system, I watch the others at the table, noting what dishes they pair together and trying my own favorites. One evening, Pom, U, and I visit their nearby family’s house for a dinner party. Over a verifiable feast of curries, lettuce rolls, and different grilled fish, I chat with Pom’s aunt and uncle, who spent much of their lives in Britain and America. The aunt told me that one of the only things that continued to surprise her, when they lived in Florida, was how large the portion sizes were. Meals in American restaurants were one large dish, with perhaps one also large side dish, and it was impossible to finish. I laughed as they explained it to the rest of the surprised family, because their impressions are accurate- American portions are large, and we make fewer different dishes for the average meal. Now that I’ve been introduced to the Thai style of eating, the idea of returning to a plate of diner meat and potatoes seems horribly boring, and unhealthy. I’ve found that I love these balanced Thai meals, and the diversity in their food. 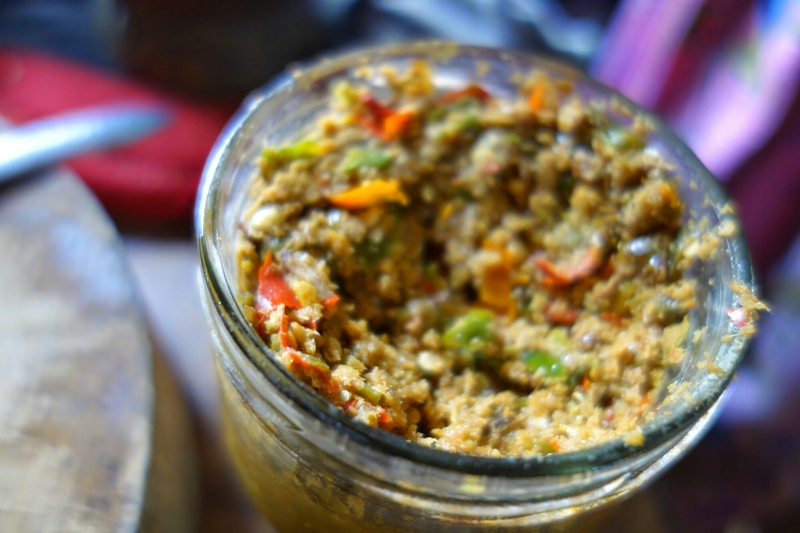 A jar full of green curry paste, a combination of pounded chili peppers, galangal, lemongrass, bergamot rind, shallots, garlic, and shrimp paste. This is what gives flavor to green curry, and though it is a long process, the product is incredible. As I cooked with Pom, we continually returned to questions of “national cuisine” and everyday, complex realities. Pom was quick to question my questions about “Thai food”. 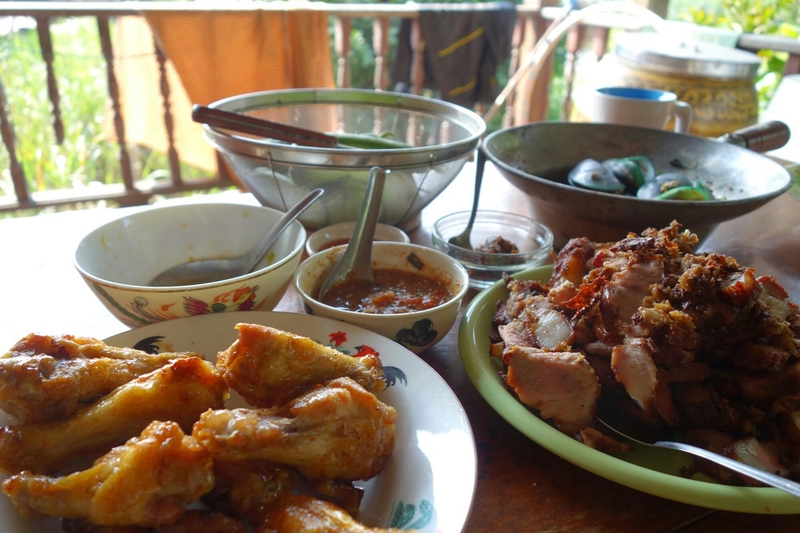 What can be said about Thai food, when regional differences abound? Questions of national cuisine are never clear cut, as tempting as it is to generalize. For every ingredient that Pom uses, she cites a difference in some other part of the country. She’s using oyster sauce in this recipe, but where her husband is from in the northeast, they use a fermented fish sauce. 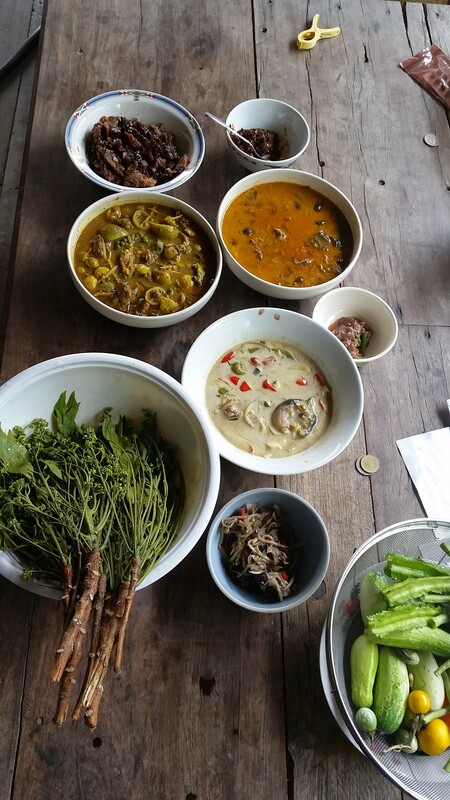 Her mother makes curry this way but her father’s side defines curry and nam phrik differently. And let’s not even get started on the diversity of rice, because that’s where the strongest opinions come out. Some now-renowned “Thai” dishes trace their roots elsewhere- a popular bright yellow dessert made from egg yolks and sugar syrup was actually introduced by Portuguese traders in the 15th century. Those soups that require chopsticks instead of the usual Thai fork and spoon are actually influences from the large Chinese expat community. But who cares, when these eaten on the street in Bangkok every day? U and I shred coconut to make fresh coconut milk. I am sitting on a stool that has a sharp blade on the edge of it, you scrape the coconut on the edge and the shavings fall below. Nothing is more delicious than fresh coconut cream! Another picture of a meal- this one includes Thai fried chicken (marinade is fish sauce and honey) and mussels. Notice the many small dips and, again, the bowl of raw vegetables. 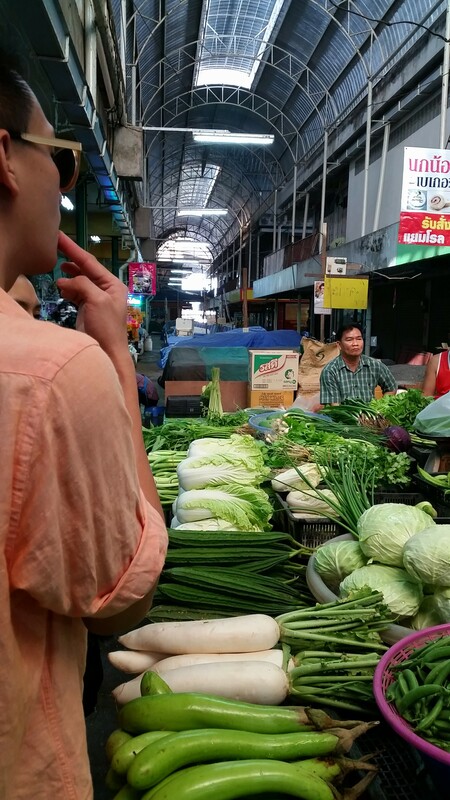 As often as I ask questions about Thai food, I field questions about American food. And while it is tempting to simplify foreign cuisine into bite size categories, when you try to represent your own county’s cuisine, you realize how complex the question can be for every country. When asked about American cuisine, what do I say? Do I talk about how I eat, my attitudes, in my position in society? What about how a typical small town Midwesterner eats, versus an urban west coast citizen? How can I express the amazing diversity in my country? And how does the average American eat? 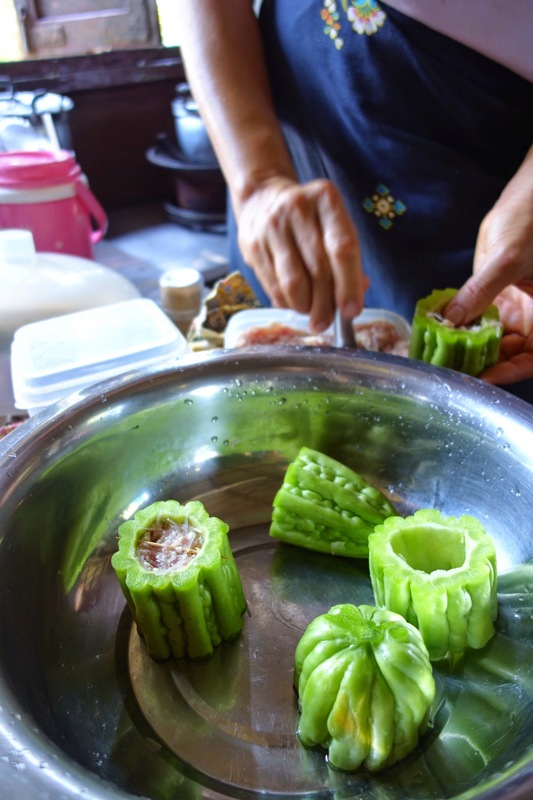 Pom stuffs a local bitter gourd with a pork paste. We boil the pieces, then eat them over rice. The bitter gourd is balanced with a sweet sauce on the side. One of my favorite dishes that Pom made- it is a sweet pork, tofu, and duck egg soup (this picture before the hard-boiled duck eggs are added). The flavors include cinnamon, anise, coconut sugar, and garlic. All of these vegetables were grown in Pom and U’s vegetable garden. We eat them with every meal. Questions that aim to define and categorize cuisine often miss that cuisine is a living part of culture. Food is always evolving. Cuisine may evolve even faster than many other parts of culture, like music or art, because it is a daily reality, a necessary act. When people need to eat every day to survive, innovations and adjustments in cuisine can spread quickly. There is no way to trace clear lines across cuisines when there is so much exchange. So how to talk about a cuisine, if it is always changing? It is an interesting exercise, to learn about the subtleties and the distinctions that can lead to the broad generalizations. I obviously love learning and writing about food. Yet, the more I learn, the more I see how complex the questions are. At a certain point, the labels of authentic or traditional start to lose meaning in the idiosyncrasies, and the joy is taken out of the real reason that we love to share our food. While I will continue to explore different cuisines, I am careful not to take anything too seriously, and to enjoy the exploration instead. So what is Thai cuisine? I’ll tell you after I finish eating. 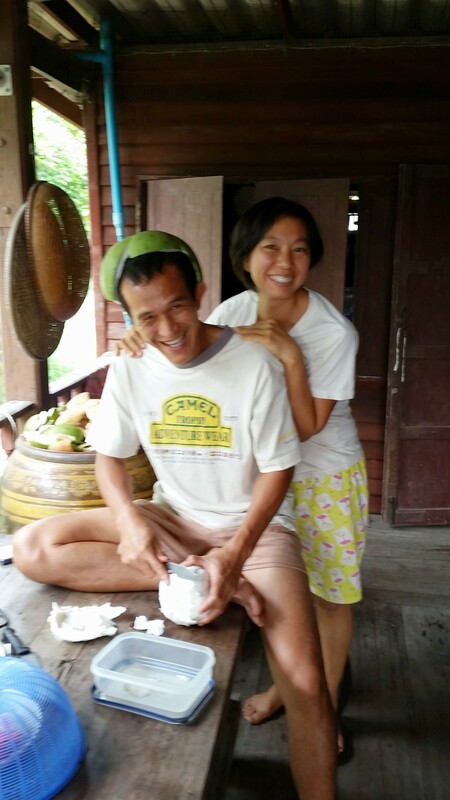 While U is peeling a pomelo, a fruit similar to a grapefruit, Pom cuts it and puts it on him like a hat. I’m happy to stay with people who don’t take food too seriously. In Thai, “gin kow” means “to eat”, but, literally, the phrase means “to consume rice”. The significance of rice in southeast Asia is embedded in the language, because if you want to eat like a southeast Asian, you will eat rice three times a day. If you are tired of rice, you can switch to noodles, which are made of rice. Afterwards, you can eat dessert, which is most likely made of rice. Rice is the staple food for over half the world, and Thailand is the world’s biggest exporter (having recovered its title, after a disastrous government rice subsidy program). In Thailand’s countryside, the importance of rice is inescapable. Rice fields stretch out from the roads further than the eye can see, parceled into rectangles and connected for irrigation. Because different farmers plant at different times, if you are lucky, you can see the whole life cycle of the crop from one vantage point. Rice is everywhere, because as my Thai friend Pom puts it, “rice is life”. A panoramic view of the nearby rice fields- the left are Pom and U’s fields, and the right are the neighbor’s fields. I love the way the fields look in the early morning and late afternoon. Pom and U own a rice farm about two hours north of Bangkok, in central Thailand. Both are former marketing and graphic design professionals who lived in Bangkok for much of their adult lives. However, after years spent in the fast-paced city, the couple decided to leave their careers and return to the countryside. 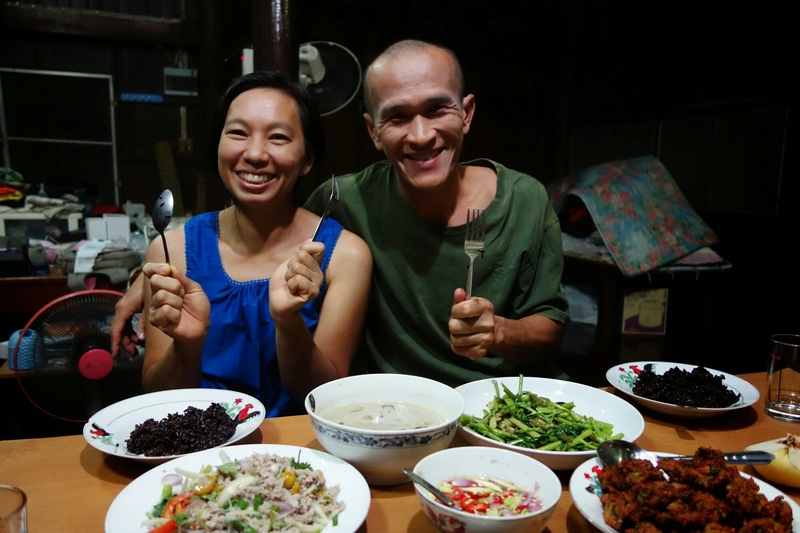 They spent a season at an innovative hands-on farm school in eastern Thailand, studying different methods of organic farming, before moving back to Pom’s family home and starting their own rice farm. Driving past highway-side rice fields, Pom and U explain to me how to “read” the rice fields. Patches of grass show that the farmer doesn’t use herbicides; the uniform rows of tall rice stalks indicate machinery and fertilizer. I watch U stare out the window as he drives, observing the rice fields. I know that he is calculating, analyzing the crops, but for me, the rice fields are simply hypnotizing. The view from the front of the house, which faces the canal. Pom and U’s house is in the flood zone of central Thailand, and for part of the year it is easier to travel by boat. Morning glory, an edible green grown in water, also lines the canal, waiting for harvest. When we arrive home, I try to read U’s rice. 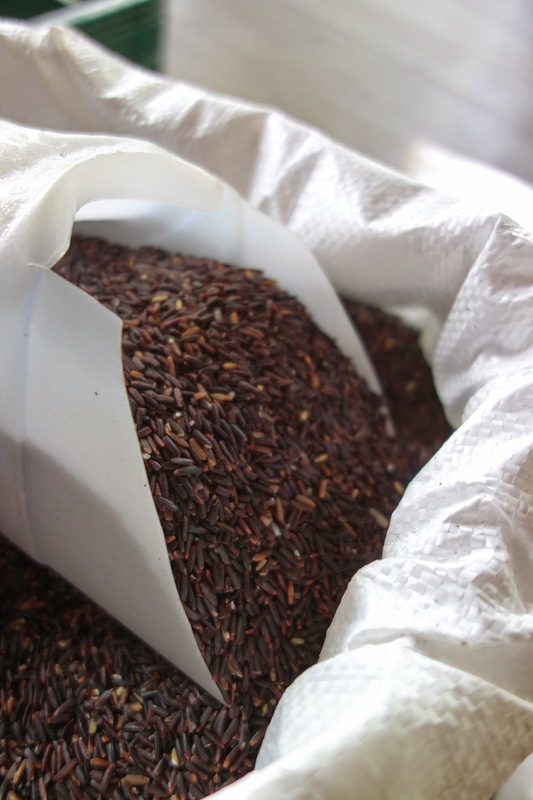 The fields are beautifully parceled into different types: black rice, low sugar rice, and scented rice. U and Pom, after studying organic agriculture, are intentional in everything they do on their farm. U chooses to plant his rice using a mix of old methods. He plants small patches by hand, ensuring a high yield for saving seeds, and other fields he plants by a simple scattering method. 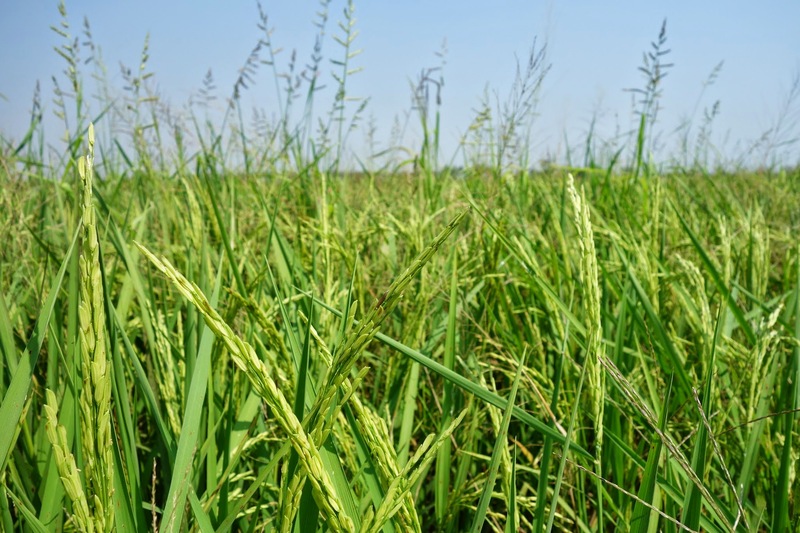 The rice is high quality and high yield, but without large machinery, herbicides, or synthetic fertilizer, it takes a lot of time and work to maintain. 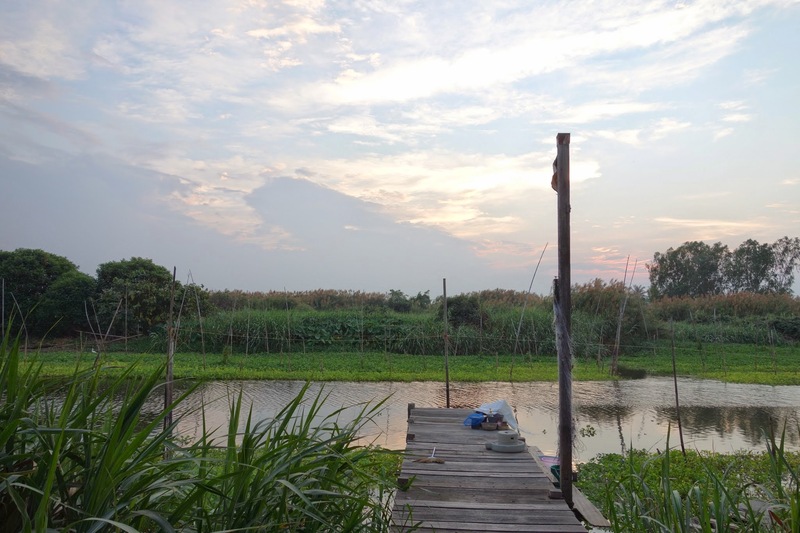 Pom focuses on the health of their soil, in the rice fields and in their vegetable garden. The couple literally brews fertilizers for their own soil. They ferment organic materials, like fish from their pond, and combine it with samples from their soil, multiplying the local microorganisms. The anaerobic bacteria in the compost, similar to the probiotics people add to their diet to aid digestion, help break up their compact soil and encourage biotic diversity. 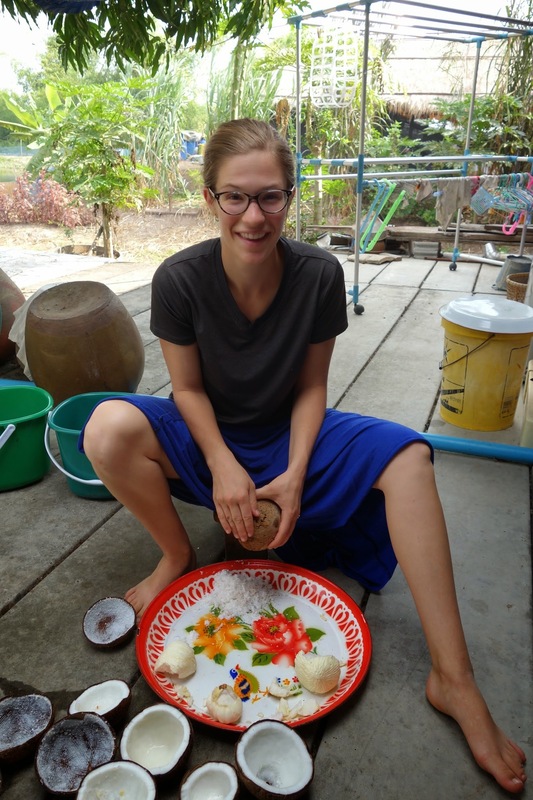 Combining the fermented liquid with different compostable materials, like rice husks, coconut waste, and rice bran, Pom and U add the concoction back into the rice fields and vegetable gardens. All of their hard work leads to an incredible product: high-quality rice that is unlike anything I’ve ever tasted. Pom and U grow unusual varieties of rice that are not found in an average market. To sell their product, they ask their customers to make an investment in the farm. Customers pay for a year of rice in advance and receive their kilos in monthly deliveries. This model allows the farmers to secure funding for the season, before they plant, and the customers receive their investment back in rice. A similar business model known as a CSA (community supported agriculture) share has been successful for small farmers in the United States as well, allowing them to pay their upfront costs before their product is ready to sell. Pom and U are not officially certified organic farmers, nor do they brand or beautify their packaging. Their business is based on selling a good product, and everything depends on personal relationships. To start their business, Pom and U gave away hundreds of kilos of their rice. Potential customers were able to try its taste, smell, and texture, and, like me, they were convinced that the rice was the best they had ever eaten. Their business has grown by word of mouth, and loyal personal relationships, ever since. Pom and U believe in their product, and they believe in their work. From them, I learn about the expanding organic scene in Thailand, growing in response to many of the same large forces as in America. I am finding the same commitment to land stewardship in Thailand that I found in small towns in the American midwest. The Thai are increasingly concerned about their health and their environment, and in many of our conversations, I recognize parallel trends in both our countries. Pom and U see their land as a resource for good food, and a good life. And, as we are learning in America and around the world, good food and a good life are not such separate ideas. After all, as Pom frequently reminded me, in southeast Asia, rice is life. 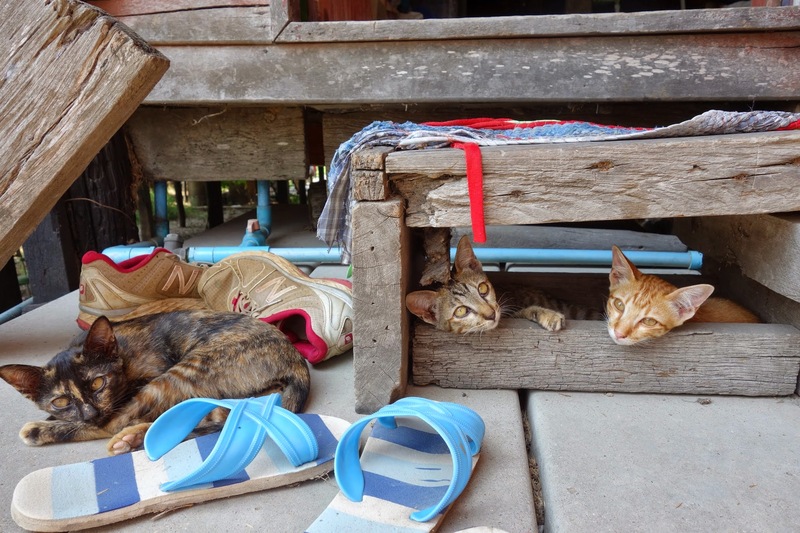 The three kittens, taking shelter near our shoes at the house entrance one hot afternoon. collect all three different colors. It’s dawn, the sun just barely peeking out from the eastern mountains, and the morning colors are subdued by the mist trapped in the peaks. 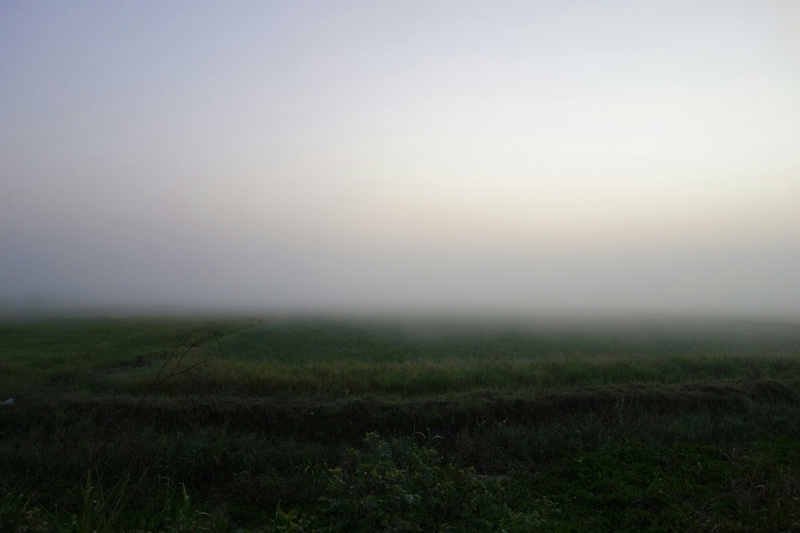 I am standing with Wat, a Karen farmer, wrapped in my scarf against the morning chill. We are looking at his fields of beans and passion fruit as he turns on the sprinklers. I’m working on Wat and his wife Poh’s farm, high up in the mountains west of Chiang Mai. I found this family farm through the WWOOF organization, a network that connects volunteer farm workers with small organic family farms. Though I have WWOOFed in America, this is my first time abroad. Thailand’s network is new, but growing quickly- just like Wat and Poh’s small farm. A panoramic view of the mountains that surrounded the farm, a scene that I would wake up to every morning. Wat and Poh are Karen, living in a Karen-dominated stretch of the mountains. The Karen people number around 400,000 in Thailand, making them the largest minority people. They are originally from Mongolia, and more recently from Burma, and there have been successive waves of immigration to Thailand. Many of the Karen that used to clash with the northward-expanding Thais are, today, Thai citizens. The area, once relatively undeveloped due to strained relations, is now flooded with development projects- new schools, earthquake monitoring systems, and scholarships for Chiang Mai University students. Construction and teaching apprentices from Chiang Mai do volunteer work in the villages. For the farmers, irrigation and water management projects, and seed and distribution grants are funded by the monarchy. These projects are encouraging development, but they also carry messages of assimilation. One cool night, Wat and I sit around the fire, talking about the Karen language. Like many non-majority languages around the world, the Karen language is under pressure. Books and reading materials published in the Karen alphabet are so rare that few people can read or write it anymore. Wat’s two young sons learn Thai in school taught by Thai teachers. Scholarships and promises of work and a Thai lifestyle lead many young people to move to Chiang Mai, away from the village. It is a story that can be told in many places in the world. The changes of development keep coming- Wat’s farm will soon be connected to electricity for the first time. The concrete poles have started to line the long, winding road from town, and the electric cables are due to be connected in a month. I ask Wat if he thinks it will change much. He already has a solar-charged battery, enough to charge our cell phones during the day and some lightbulbs at night. What will he do when he has access to more electricity? Today, Wat and his family still speak Karen at home, and the social ties in the community remain strong. Younger university students spend the week in Chiang Mai, and then return to the village every weekend. The introduction of electricity lines, ice cream, and television don’t seem to have changed too much- the Thai Karen people, though regionally diverse and different, may be large and powerful enough in number to maintain their culture in the midst of Thai society. With an abundance of ripe bananas, Poh and I peel some to dry on trays in the sun. When we need our lunch to-go, Poh wraps fried rice in a banana leaf and ties it with bamboo- the most “environmentally friendly” takeaway container I’ve ever seen! There are two principle industries in these mountains: agriculture, and tourism. Truckloads of tourists drive in every day from Chiang Mai, stopping to do river rafting and trekking with a guide. “Homestays” abound, and the elephants once used for logging are now ridden through the forest. It is a growing industry, and more and more people visit every year. Wat used to work for a tourist company, but has recently started to make his living on his farm instead. Most of the surrounding Karen farmers grow organically, following the long tradition of their families. But today, it pays to become officially certified. Farmers receive a higher price for organic produce in Chiang Mai and beyond. The farms around here all seem to specialize in growing organic bok choy; fields of bok choy can be spotted from every road. On harvest day at the local packaging center, hundreds of kilos of the Asian cabbages are washed and wrapped. But this is where the Karen farmer’s role ends. Being so high up in the mountains, and still slightly apart from Thai society, few farmers sell directly to any market. Instead, Thai middle men distributors buy from the farmers and distribute regionally. Like in many agricultural economies, it is in this middle transaction that most of the profit goes into the distributor’s pockets. Cutting down stalks of bananas one afternoon, I ask Wat why he doesn’t sell them- his property is covered in banana trees, producing more fruit than the family could ever eat. As we lug the heavy stalks back to the house, climbing a steep hill, Wat tells me that the average price he gets for this amount of fruit would be 20 baht ($.60). The distributor would then resell it in the market for 120-150 baht ($3.50-4.50). It isn’t worth his time to sell bananas at that price. After carrying many stalks of heavy bananas, I understand his position. However, Wat is investing in a different fruit. While I am at the farm, we plant dozens of passion fruit vines, and install the trellising posts. He has taken out loans with high interest rates to pay for the young vines and more seeds, and it is a risk. Until the vines start producing fruit in a year or two, Wat will continue to grow his normal vegetables- mostly beans, peanuts, and bok choy. But Wat is a businessman, and as he tells me, “my uncle grows vegetables for 20 years, and he still makes the same amount of money selling them.” Wat is starting to invest in high-demand fruits, like passionfruit, and pineapple, to make his farm profitable. It is his attempt to take some profit back from the distributors. His plan, growing “little bit, little bit” every year, may work. A young passion fruit vine, surrounded by other plants and trellising poles. Though buying the plants was expensive, this was Wat’s big investment this season. Beans, climbing up poles. The little plants that had just been planted when I arrived were a few feet tall by the time I left! One Sunday, Wat leads me and three other WWOOF volunteers on a long trek. We are hiking toward a nearby mountain peak, to explore a series of caves. Wat, hiking more adeptly up the slippery rocks in his flip flops than we are in our big boots, leads the way. As we cross a forest clearing, snapping branches and twigs underfoot with no discernible path, I ask Wat how he knows what direction to go. He grins. “I don’t know how to describe it…” He turns, and points. “This way.” I continue to follow him, grateful to be with someone who knows these dense mountain forests so well. On our trek, we pass through giant groves of teak trees, a hundred feet tall and perfectly straight. Teak wood is a valuable wood for building- it is durable and water resistant, perfect for outdoor uses. Wat tells us that he is able to cut down these trees for his own use, but he is forbidden to sell the wood. The Thai government, in recent years, has taken many steps to protect the northern forests. Industrial logging is controlled and regulated, which is helping the forests regrow from previous deforestation. However, fires continue to pose a threat, especially in the dry month of March. Wat, having worked as a forest firefighter when he was young, tells us how difficult it was to control fires during the dry season. Many of the enormous fires are started by farmers trying to clear fields, or chase animals out of the bush to hunt. Every year, some of these fires spread too quickly, and homes are destroyed. Even in Chiang Mai city, the “burning season” casts a haze over the city. Wat is aware of the value of protecting forests- some nights, as we eat dinner, we can see fires on the mountains in the distance. Wat tells us not to worry, because the ground isn’t dry enough yet for the fire to spread. But he sighs and laughs when he sees the fires, knowing that they will get bigger in the months to come. Protecting these forests will allow him to continue farming the way that he does. These forests are where he grew up, where he has built his home with his wife and two sons. For all of them, I hope that these forests continue to be protected. Wat and I, having climbed up into one of the caves for a photo opportunity. We had brought bags to collect some bat guano for fertilizer, but at the last minute, Wat decided that he was too lazy to carry it all the way back to the farm. Wat pauses to stare at an odd tree- the old trunk is one type of dead tree, and a tree of a different species sprouted and grew inside of it. The forests in northwestern Thailand contain many mysteries! Because Poh is older than me, in Karen culture, I am to call her “sister”, not her name. Many days I “help sister” clean, cook, and plant. My favorite days, I follow her and her mother into the woods to cut firewood. Poh and I use a two-person saw to cut logs from fallen trees, and her mother, who I call “auntie”, splits them with an ax faster than anyone I have ever seen. They use this firewood to cook every meal, and the family is stocking up before the rainy season starts. After days of persistent but polite inquiries of “can I help?”, Poh allows me to help her prepare for dinner. Her and Wat both like to cook, and I love watching them. Most of what they cook is stir-fried, which is a delicate art to master. The wok is hot and the cooking speed is fast, but the product is delicious. 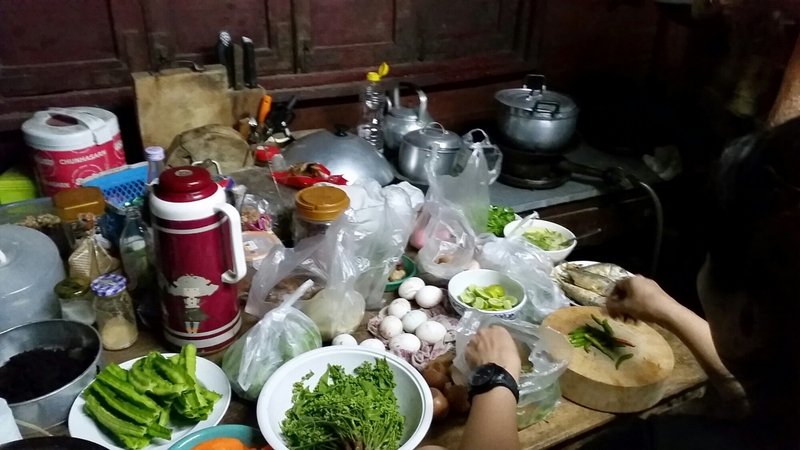 Wat and Poh typically cook Thai-style food for the volunteers. Their Thai food is sweet, less spicy, and involves a lot of coconut milk, appealing to foreign palates. 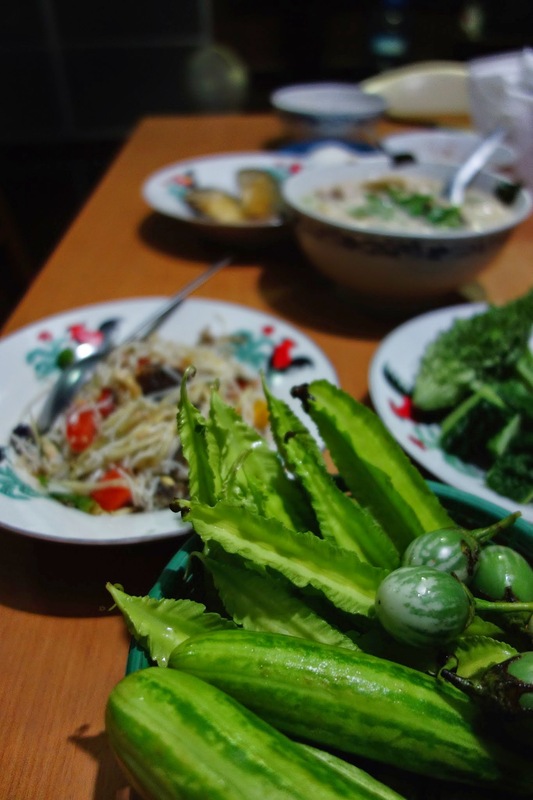 One day, after I make a request, Wat cooks a Karen dish, a type of bok choy and pork soup. The soup is earthy and spicy, featuring turmeric, bok choy, and pork skin. After long days of sweating under the sun, every dish they make tastes absolutely amazing. Poh cutting loofah, a vegetable that I have seen grown in the southern US. It’s similar to a zucchini or cucumber, and delicious in stir fry. Freshly boiled peanuts- creamy, earthy, pea-like, surrounded by a inner soft shell and the hard outer shell. Poh makes me crack up, as usual, as we eat freshly boiled peanuts. My last two days at the farm, I help Poh and Mugar (auntie) with weaving. After watching them for a morning, mesmerized at the rhythm of their movements, I try myself. I spend the afternoon making mistakes, patiently corrected by their experienced hands, but by the end of the day I am able to weave a simple patterned scarf next to them. The day before I leave, we weave all morning and afternoon. The two older women occasionally jumped in on my loom, weaving a few inches on my scarf in a quarter of the time that it took me. Only the next morning did I understand their hurry to help me finish this scarf- it was a gift for me, to take home and remember the family by. As I ran my fingers over the weave, I felt overwhelmed. I learned so much on this farm, working alongside Wat, Poh, and their two children. This scarf represented all of that to me- I could trace my progress in the weave, and see it bordered by sections completed by hands of experience, the hands of my teachers. I have felt so lucky to spend time on this farm, and create connections to this family. It has reminded me that we are all connected by many threads. Me learning to weave the first day, with Poh carefully watching me from nearby. The Karen use a sort of hand loom, keeping the threads taut by securing one end to something stable and the other end wrapped around the weaver’s back. Auntie and I, weaving next to each other. She is completing a scarf as well, but her pattern is more complicated, and her fingers much more nimble. A closeup of the scarf that I wove, one of the greatest gifts I’ve been given on this trip.